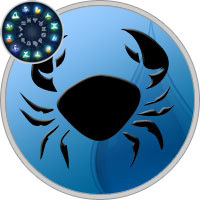 Being a Cancer born on July 15th, your personality is dominated by an empathetic, intuitive and optimistic nature. You are greatly in tune with your own emotions and the emotions of others, often knowing how people are feeling without being told. You have a positive outlook on life and do your best to imagine the best possible outcomes in situations. Your understanding and optimism are greatly appreciated by your friends and family. Water is your paired element and in fact, out of all the zodiac signs, you have the most fundamental relationship with water. Similar to rocky ocean waters, you often experiences emotion in waves. You use these experiences to understand the complexities of emotions and apply them to yourself and the feelings of others. As you continue to embrace these qualities of water, you will grow into an even more compassion individual. Be aware of the possible negative influence of water, as becoming fully submerged in the "seas of emotion" will lead to times of emotional instability. While the moon is the ruling planet of your sign, because you are born in the third Decan, or part, of the sign, you also are subject to the planetary influence of Neptune. This planetary combination contributes a double dose of sensitivity and compassion, as Neptune shares in the same emotional nature as the moon. However, Neptune’s influence does introduce aspects of spirituality and imagination as well. As a result, you are a highly romantic and culturally inclined individual. You are greatly excited by the novelty of romance and have high expectation from your romantic partners. While this may temporarily lead to disappointment when reality does not meet expectations, your optimism can quickly remedy the situation. Your imagination is one of your greatest assets, but be weary that too much time in fantasy can lead to a disconnect with reality. July 15 Cancers understand better than most people just what the harmonics of day-to-day relationships signify in their lives. These people are sensitive yet strong. They have a powerful attraction to beauty in all its aspects and seek to replicate it in their own lives. Despite their charming personality, they are extremely sensitive and easily hurt. July 15 natives have a genius for attracting individuals who can teach them the lessons they need to learn.